Researchers at MIT recently revealed an elegant solution for anyone looking to get a little more power out of their bicycle. Developed by MIT’s Smart Cities programs, the GreenWheel is a self-contained electric wheel that can turn any pedal-powered bike into a fully-electric bicycle! 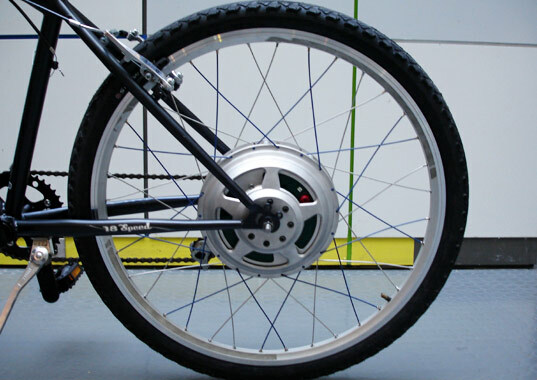 The GreenWheel is essentially a bicycle wheel that has an electric motor and batteries embedded within it. The full casing is quite small and is able to be retrofitted to any bike. Simply twist the handle mounted throttle and a bluetooth connection tells the electric motor to provide thrust. The wheel can be charged by plugging to the grid or by pedaling, and a full charge will give the motor a range of roughly 25 miles. The GreenWheel was developed by Ryan Chin and Michael Chia-Lian Lin as part of MIT’s Smart Cities programs. The objective is to create a working prototype that can be installed and retroffited to any bike. The team is also thinking for the long term - they estimate that the batteries for the GreenWheel will last around 40,000 miles, or about 8 years worth of travelling.